Inder Loves Folk Art: Flashback Tank Top. 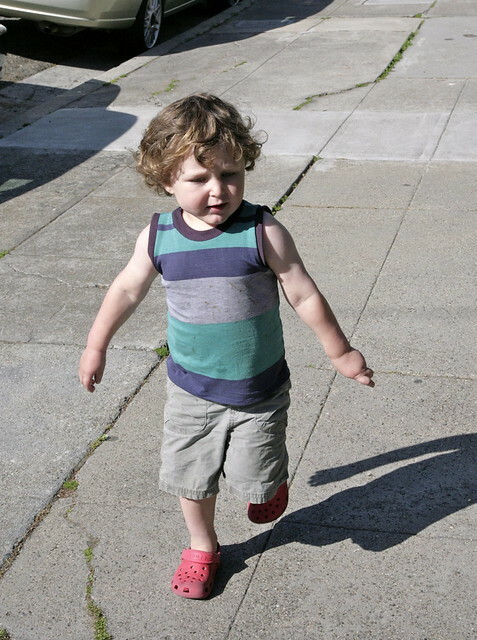 This past Saturday was a lovely warm day, so I took a short break from baby pants to make Joe a little tank top using the Flashback Skinny Tee pattern. 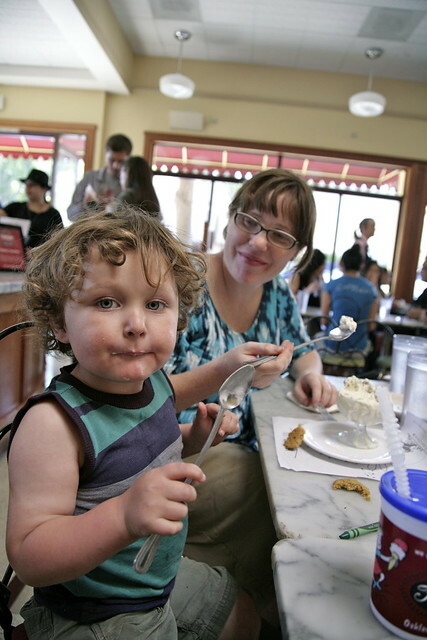 And then we took Joe out for some ice cream at Fentons, where he proceeded to get a ton of food on his tank, making for a fun, but not necessarily pristine photo shoot. As you can see, Joe and I have matching tops now. I was totally inspired by Kristin at Skirt as Top's awesome Strong Boy outfit, but my fabric choice - a thrifted men's polo shirt - does not have the same vintage appeal as her stripes. I did, however, follow Kristin's suggestion to narrow the shoulders a bit. And I just have to say, this tank top was super easy. The whole thing, cutting, sewing, everything - probably took an hour. And what could be cuter than a three year old with chubby arms and dimpled chubby hands in a muscle tee? Well, pretty much nothing. 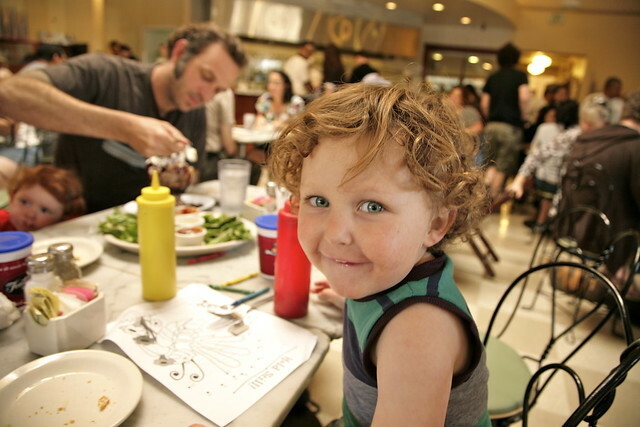 That's my little red-headed niece and brother-in-law across the table. Nerdy sewing note: The stripes on the thrifted polo shirt I harvested this fabric from were actually vertical, even though this was perpendicular to the stretch of the knit. I suppose for a loose man's shirt, you can get away with this! Fascinating! The fabric does have some two-way stretch, but since this is a pretty snug t-shirt, I sewed up Joe's shirt with horizontal stripes, to stretch across the width of the shirt. And I had just the right dark purple ribbing to finish the job. This top was so, so easy (oops, I already said that, huh?). I am already planning on sewing up more of them. And that's Steve eating a chili dog back there. Hehe. And here's Joe, food-encrusted and none too pleased to be heading home from the ice cream place. Not the best photo, but at least you can see the whole top. New top, complete with fresh ketchup and ice cream stains! After making five pairs of baby pants and a quick tank top for Joe, I turned my sewing attentions to making a ring sling for carrying the little bambina around in. Now, this should be a very straightforward project, right? If anything, I was expecting such a basic sewing project to be boring. Which is why it's funny that I have completely stalled. The issue is the pleating at the top of the ring sling, where you thread the fabric through the rings. The instructions I was following just weren't working out and I couldn't get that area to look right, so I did a little internet research on the topic, only to discover that there are a million different ways to pleat a ring sling, and each method features an intimidating list of pros and cons. So now I'm overwhelmed and paralyzed with indecision. Over a project that basically consists of a single rectangle of fabric. Go figure. Can someone knowledgeable about ring slings come along and just tell me what to do? I may not be much of a sewing pioneer, but I promise, I take direction very well! Do you even need to pleat the sling? Or can you just let it all gather right up there on the ring like a curtain? Or... forget the ring thing and make a pouch-style one instead! I had a pouch for Clem (not homemade, this was pre-my sewing days and I can't believe now how much I paid for something so simple) but anyhow, I used it a lot. Although I can see how the adjustability of the ring sling would be good. You wouldn't believe what a science this all this! So if you just gather it at the top (or if you do shallow pleats), the tendency will be for the fabric to spread out and fall down your arm while you're wearing the sling, thus hampering arm movement, etc. It's so complicated! We had a pouch sling for Joe, but it was always too big for me, and too small for Steve. So my hope was that an adjustable sling would work better for both of us? I'm going to conquer this thing, I promise! I remember reading your summer posts and just sighing with longing for warmer weather, so I sympathize! But don't worry, most of our actual summers are foggy and dreary, so you'll most likely only be subjected to this in late fall and late summer/early autumn, when the sun graces us coastal dwellers with its presence. I'm sorry I have no help to offer on the sling, I used a moby wrap and haven't attempt a ring sling. As for the tank top, I love it! Stripes are my favorite "boy" pattern and I think husky toddlers looks so awesome in muscle tanks. I better get started on a few for Jude! "Husky toddlers" - Joe is kind of husky, hee hee! At his 3 year well check, he weighed in at 36 lbs! No wonder I'm having a hard time hauling him around at 31 weeks pregnant. I have a couple ring slings that were a gift from our friend Katy, who makes them on a regular basis (and sells them even). Would it help to see one that someone else made? They're very durable and strong. If you don't mind taking a photo of the shoulder/ring area with your phone and sending it to me, that might be helpful! My dilemma now is that there are strong supporters and detractors from every method, and people seem to have individual preferences. Well, fair enough, but I've never used a ring sling (I had a pouch with Joe) so I don't know what I might prefer! I adore this top as much as I knew I would. Also now I desperately want to (get ice cream all over my shirt) eat some Fenton's! Looks like a beautiful day for it! Do it! This was one of the internet resources I found and I think at this point it's the strongest contender. The instructions I was following called for an "accordion pleat" (symmetrical with a box pleat in the middle) but I just couldn't make it work with my fabric. I may try this type instead ... It seems there are devoted followers and detractors for every method. Gah. Can't help on the sling construction as I have never made one, but after a week of over thinking all my projects, my advice is to pick one and just do it! Yes, I saw your post, and we seemed to be in the same boat this week! Well, I've moved on - for now, anyway - hope you have too! I used a sling for Matilda,she went in a pram once! My advice is to get it fitted by a physio, I did,and even with a dural tap back injury used slings until she was 2+ and able to walk well on her own. PS Joe is so cute! That's an awesome idea, why have I never heard about this? You really had your sling fitted? Too cool! I need to start making clothes for my kids. You're so inspiring. I can't get over how much Joe and Mikko look alike (at that age). It's the fabulous body type and curls, I suppose. Which is how I know a muscle tee would look amazing on Mikko, too, so now I'm going to have to make one. That's settled, then. Totally the Crocs! 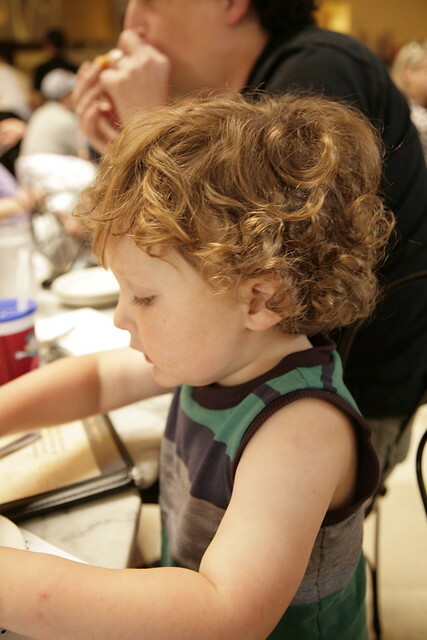 And the curls, and the cheeks. I often think the same thing when I see photos of Mikko (especially older ones) even if Joe was not *quite* as Buddha baby as Mikko was - Mikko gets some kind of award for Buddha baby, I think. :-) Which is to say, yes, he would totally rock a muscle tee. Cute tank and I love his cheeky smile in the second photo. I've definitely got to try sewing a tank top since we're finally getting sunshine here. Hey thanks for linking to my strong boy! :) Joe looks fantastic in his muscle tee. Aren't they easy??? I need to make another...it just cracks me up when my little guy wears his.